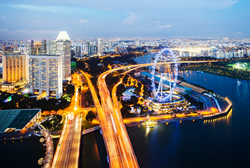 Solace’s data movement technology has been selected as a key infrastructure component of a Next-Generation Electronic Road Pricing (ERP) system being built for Singapore Land Transport Authority by a consortium of NCS and Mitsubishi Heavy Industries Engine System Asia (MHIES-A). The Next-Generation ERP system, which makes use of advanced satellite technology for congestion management, will enable more efficient information flow between sensors and vehicles and overcome the constraints of physical gantries. In addition to the infrastructure and sensor network that Solace message routers will be a part of, the Next-Generation ERP system will see the replacement of an existing In-Vehicle Unit (IU) with a new On-Board Unit (OBU) that will be able to provide additional services to motorists, such as disseminating traffic advisories. It can also be used to electronically pay for parking and checkpoint tolls. Solace provides technology that improves the speed and efficiency with which information flows between applications, connected devices, datacenters and people. High-speed, reliable information sharing is a critical part of modern IT initiatives from accelerating legacy business processes to enabling big data, cloud computing and the Internet of Things. Solace unifies many kinds of data movement so companies can cost-effectively move all of the information associated with better serving customers and making smarter decisions. To learn more visit http://solacesystems.com.